Our not so little group is bus-bound for the Czech Republic. We are actually at the border as I write this. There is little that happens for us, however, as passport checks are random. I guess if we were coming from Hungary, things would be a bit more strict because of the Syrian refugee crisis. It is about 12:45 a.m. and we have been on the bus for about three hours or so. I think of the numerous times I have driven back and forth to Wisconsin from Pennsylvania. By the time I have made it through PA, I could have driven through two or three countries here in Europe, and more significantly needed two or three languages. Today was an astounding day for me. I have noted both times I have visited Auschwitz that I am astounded, really speechless, as I have left, but that astonishment or inability to verbalize was because of the reflection on the events. While there are still some barracks and the ruins of the crematoria, it is not the building artifacts as much as the combination of reading, the displays, the weather (both years it has been bitter), and ultimately walking the sacred ground where so many Jewish people were needlessly exterminated. Late this morning (or technically now yesterday morning), we visited Schindler’s factory where he protected so many Jewish people. The factory has been turned into a museum and it is a walking, listening and seeing tour of what happened in Kraków as the Nazis invaded Poland on September 1, 1939. I have posted a number of pictures on my Facebook page. The tour today might have brought me closer historically and emotionally to the consequence of the German invasion than anything else I have ever witnessed. I think having walked the Jewish quarter earlier this week was probably significant in preparing me for this visits, though I did not realize it the other day. The manner in which the factory/museum was laid out allowed the viewer to come to terms with the extreme nature of the German Blitzkrieg. From the extensive signage to the pictures of the destruction; from the pictures of men hanging to the pictures of the Nazi high command; from the air-raid sirens wailing to the recorded German announcements, it felt as if you could imagine being on the streets of Kraków on those fall days of 1939. As I saw the picture of the SS raising the Nazi flag above Wawel Castle to walking between the actually Nazi flags hanging from the ceiling, it was nearly impossible to not feel as if I had been transported to Poland in the days and weeks following their defeat. Yet, this was not the most profound thing I witnessed in the famous factory. It was the realization that I was again walking in the Jewish ghetto, where so many either lost their lives, and so many more would still end up with the same fate. The German sign that said Krakau Haupt Bahnhof or the trolley with the sign on the side stating “Benutzen durch Juden Verboten” transported me to thought of Rosa Parks and how we did the same things to blacks in America. In the case of Poland, the switching of signs to German was another way to strip the Polish population of their identity. As I walked through the museum it was impossible to feel any sense of immunity from the travesty that was Poland or Kraków in 1939 and beyond until the end of the war. Of course, then Stalin and the Soviets took over and, at least from my Western mindset, one totalitarian regime replaced another. Following our visit to the factory/museum, we returned to theJewish quarter in search of an authentic Jewish restaurant for lunch. We actually had lunch in a small place that was on a block of Jewish shops and restaurants that was used in the movie, Schindler’s List. I had, I think, my first glass of Kosher red wine. As I am writing this again, I should note it is almost 6:00 a.m. and we are close to Prague at this point. It does seem we will have a bit of a long day. I have gotten some sleep on this bus, but I am not sure how restful it had been. There is another language to navigate and another exchange rate to understand, but all of those things are manageable. . . . It is Saturday evening in Prague and today after a morning nap, we had about a 4 hour tour of parts of the city. 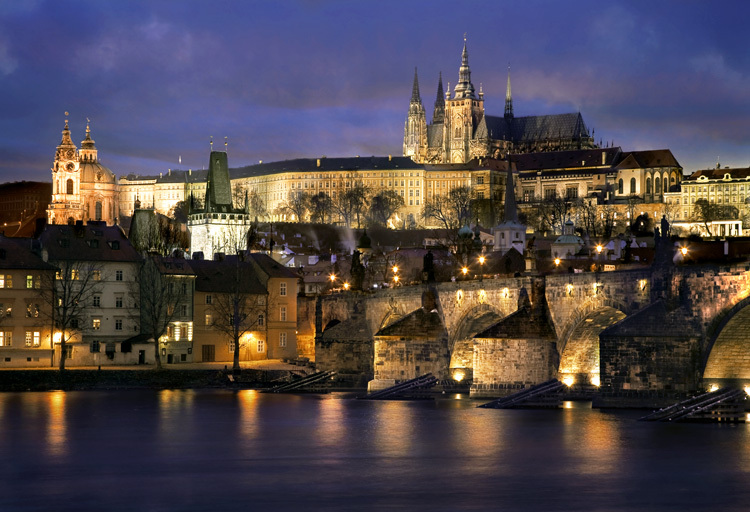 Prague is without comparison everywhere you look. It is certainly a tourist city also, but the palace, the cathedral, the old town and lesser town are all phenomenal. I think I could just eat my way across Europe and be perfectly content. There is no eat and run; it is about making each meal an experience. Those of you who know me, know I am all about that. I have so enjoyed getting to know some of the students. There are some very thoughtful and inquisitive students. One in particular reminds me of how I was my first time in Europe feeling as if I am in a history book and walking through the pages. The amazement in the eyes like a little one seeing the Christmas tree lit for the first time makes the entire trip worth it. The desire to be the sponge soaking up everything is what it is all about. During the time here, students have been exposed to a number of experiences as well as classes. They are taking two classes, one on Eastern European Film and the other on Eastern European culture, with a specialized sort of case study emphasis on the Jewish culture and their historical processes. The film class is rather Avant guard, but the professor, Dr. Majiec Stroinski, is brilliant, challenging, and himself a bit Avant guard, but that is what makes the class so amazing. You are someone disarmed by his sort of playful attitude, but do not fear, his understanding of film and its ability to teach us about ourselves is spot-on. The second class on culture is being provided by one of the foremost cultural anthropologists certainly in Eastern Europe if not globally. Dr. Annamaria Orla-Bukovska is passionate, kind, challenging and astounding. There are times the students are quite unaware of the opportunity they have to sit and listen, speak and learn from some of the brightest minds the world has to offer them. Every day I am in awe of what I am hearing and learning. Then there is the experiential element of the class, merely to walk around and be that sponge, the one referred to earlier in the post. Some are soaking up other things from time to time, but that too is learning. There is yet another part to my being in the Czech Republic. This morning I had the opportunity to walk around with Dr. Polyuha, who is much more knowledgeable about Eastern Europe than I am. He is Polish and Ukrainian, and a serious polyglot. He is also brilliant. It was so helpful to ask his opinion about things this morning and get a quick history lesson on the differences of the former Soviet-bloc countries. During the early part of WWII, the Sudetenland was annexed by the Germans. This is where Lydia was from. “Ethnic Germans and ethnic Hungarians who accepted German or Hungarian citizenship during the war lost their Czechoslovakian citizenship and were forcefully deported; while some ethnic Hungarians had their citizenship restored by 1948, the ethnic Germans were never given such forgiveness, and as a result about 1,600,000 ethnic Germans were deported to the American-occupied zone of Germany and about 750,000 to the Soviet-occupied zone. Somewhere between 20,000 to 250,000 ethnic Germans died during this period, most from starvation and illness, but there were reports of many murders and suicides” (World War II Database). Lydia was directly affected by this action and never forgave the provisional Czech government for what happened to her parents. History is such a complex thing. Even now we heard about struggles in the Czech Republic regarding their current president. While under Soviet rule there as the Prague Spring as it is called in 1968. They (as Czechoslovakia) were freed from Soviet rule in 1989. Within three years, the Slovakian portion of the country moved for and was granted autonomy and in 1993, the Czech Republic again became a country. They are much more like their German neighbors in attitudes (according to what I can find), but their language is more Slavic. Again, this is an interesting combination. Language-wise they are much more like Poland. There are things I can say here like good morning or thank you and there is not a lot of difference from Polish, the spellings and the sounds are also similar. Yet, it seems they relate much more to their German neighbors. The former Slovak portion of the country is much more Slavic or Russian. What an amazing area of Europe. Today when talking about the palace and cathedral here in Prague (Praha), we learned of a 1,000 year building history. The old town was founded in the 12th century, the new town, so much younger, in the 14th. Oh my! And I thought my house was old being build in 1905. Amazing how perspective changes. These are the things we are walking amongst during this next couple days. There is so much to learn and see. I am so blessed to be on this trip with my colleague and these students. I too feel like there is part of my sponge that needs to soak up this experience. Until I wring out some more in another post, thanks for reading.